Carrot Cake Ice Cream Sandwiches are the ultimate springtime treat. A thick layer of ice cream is sandwiched between soft and chewy carrot cake cookies. They’re perfect for making ahead and storing in the freezer for a quick and easy dessert! Pre-heat oven to 375F and line two 9-inch square baking pans with parchment paper. In a large mixing bowl, add the sugar, almond butter and coconut oil. Using an electric mixer, beat on high until creamy. Add the egg and vanilla and beat until smooth. In a small bowl, whisk together the buckwheat flour, almond flour, cinnamon, baking soda, baking powder, salt, nutmeg and ginger. On low-speed, gradually add the dry mixture to the wet mixture until a dough forms. You may need to stop a few times to scrape down the sides of the mixing bowl. Stir in the shredded carrot. Divide the dough in half, and spread out in a thin layer in the prepared baking pans. The dough will be very sticky. See tip below in the notes. Bake for 10-12 minutes, or until the edges start to brown slightly. Do not over bake. Once the cookie layers have cooled, line the same square pan with parchment paper, and place one of the layers in the bottom. Spread the ice cream evenly over the bottom layer. Top with the other cookie layer, and press down slightly so it sticks to the ice cream. Place in the freezer for 6-8 hours to firm up. When ready to cut into squares and roll in sprinkles, remove from freezer and let sit at room temperature for just a few minutes. Cut into 16 squares and roll in sprinkles. Place in an airtight container and store in the freezer. If you don’t have two square 9-inch pans, just bake your cookie layers one at a time. Make sure the almond butter and coconut oil are at room temperature. This will ensure they cream together smoothly with the cane sugar. This recipe calls for light buckwheat flour. You can use dark buckwheat flour, but your cookies will be darker in colour. The cookie dough will be sticky. I recommend covering your hand with a small sandwich bag that has been sprayed with non-stick spray. This helps spread the dough out in the pan without it sticking to your fingers. In order to ensure the cookie layers are soft and chewy, be sure not to over bake them. They will firm up as they cool, and if you over bake, they may be too hard for the ice cream sandwiches. You can use a non-dairy ice cream, dairy ice cream or frozen yogurt. Vanilla or coconut flavours work well with the carrot cake cookies. Soften the ice cream slightly before spreading it on the cookie base. This can be done by leaving it in the fridge for an hour before using. Before you cut and roll the sandwiches in sprinkles, let them sit at room temperature for a few minutes. This will help the sprinkles stick to the ice cream. If you don’t have sprinkles, try rolling the sandwiches in toasted coconut or crushed walnuts. To keep this dessert dairy-free, use dairy-free ice cream and sprinkles. 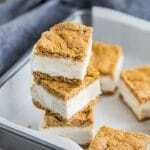 Recipe inspired by She Likes Food Carrot Cake Ice Cream Sandwiches.